In todays time it has become quite essential to give your readers ways to connect with you on different sites. Any blog you visit surely has a facebook, a twitter, linkedin and youtube (only a few) icons placed somewhere on the webpage which allow the user to connect with them. And yeah, don’t forget the subscribe box next time. Sometimes it is great to have all those items like Facebook page, Twitter link, LinkedIn page, Youtube page and RSS feeds icons or gadgets on your page. However, I find that sometimes it is easy for readers to just glance through all of them without clicking them (unless we re-design our site). Even with the widgets like WP-Greet Plugin is not doing so well for me. One thing I realized it worked so far is to write a line of sentence remind the user to subscribe to your social account at the end of your post manually worked better. Do you practice the same method or putting social share gadgets is already working? I think that the more options you offer today the better as people want variety and so usual and standard attitude to blogging. I would include everything into the blog like Facebook links and FeedBurner and a chance to subscribe. As I say we just use Facebook, Twitter and FeedBurner, however at the bottom of each post you can see loads of other buttons to share the blog with, not follow though – I don’t have the time to create that many accounts! 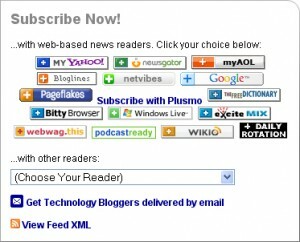 There are loads of RSS readers available but some are already built in on browsers. Bloggers love readers who keep on coming back because they find something useful and interesting in the articles. It would be great to know that whatever thought that pops up on your mind and write it to your blog, is interesting enough for someone to read. Browsers provide on solution, however I believe that social media and email subscription is much more common nowadays. Bravo on adding your first comment and becoming part of the community! There are truly many options today with more and more social media sites springing up. However, I think the first thing should be what you’re looking for. That will determine what options you should include. For one, I’m considering adding email subscriptions with an autoresponder. I think that has many uses. A little bit of everything should do the job just fine. I don’t use FeedBurner right now, but i should give it a try and stick true to what i mentioned above. You really do need to try FeedBurner! I give two thumbs up for FeedBurner. What I really like about it is that there’s a feature wherein readers can subscribe to a blog via email. I believe this can increase email list. I’ve read all previous blogs and they are full of interesting ideas. Probably best way to increase the amount of traffic on a blog is using Facebook and FeedBurner. Yes, Twitter too, but you rarely get any permanent positive traffic that stays with you, it’s more of a pass-along thing.